I’ve been focused on the laptop screen for 20 minutes without typing a word. It’s not that I don’t know what I have to write… it’s that I’ve been struggling for a headline. As usual I’ve trawled the back catalogues of two of my favourite music legends; song titles have long been a source of headlines for many scribes, and this time Neil Young won. Sorry Bob Dylan. After 24 years at Mortons Media Group it is time to hang up the pencil and retire. There, I’ve said it. Retire. I’m guessing that many of you reading this will only know me as the editor of ‘your’ magazine, Classic Racer, but in my almost quarter of a century working in the business I’ve worn many hats. I joined the company when Mortons acquired Old Bike Mart, its first dip into the world of motorcycling, as its managing editor, and in the following years I was involved in the acquisition of Mortons’ huge stable of motorcycle and scooter titles. From the moment I became involved in tracking down new titles to add, Classic Racer was always on my list. It’s a long story, but it took some landing. After rising to the dizzy heights of publishing director, with responsibility for more than 20 assorted magazines in the group (and all the stress that goes with it), I took a step back, worked fewer hours, and ended up as the editor of my favourite magazine, Classic Racer. The last few years have been amazing! I’ve met some incredible people – from Grand Prix legends to loyal readers – visited some great events, and even had the occasional ride on really exotic machinery. But I couldn’t have achieved any of it on my own. I have, without a shadow of a doubt, enjoyed the support of the most loyal, talented, and inspirational group of contributors in the business. Long may you all continue to fill the pages of this magazine. And what a great team we have in-house at Mortons! From advertising sales and design to subscription fulfilment – and everything in between – Mortons has a great depth of talented people, many of whom, I’m proud to say, I recruited. And to all the loyal advertisers I say a sincere thank you; it’s an example of what a great hobby we have that many of you are now personal friends. But the most important people out there that I need to thank are you, the loyal readers. You’ve continued to buy ‘your’ magazine, you’ve praised me and the team when you’ve thought we deserved it… and you have put me right when I’ve made the inevitable mistake. I’m not moving to another planet, instead the new editor (more of him in a minute) refused to let me ride off into the sunset and persuaded me to contribute to the magazine… so I hope to see many of you at shows and events for a lot of years to come. You will have probably noticed that throughout this I have failed to name names? I’m not daft enough to risk missing someone, but you all know who you are and I will always be grateful to you for making my job on Classic Racer so pleasant. However, there is one name I must mention, the new editor. Tony Carter will be familiar to some of you I’m sure; he’s been with Mortons a while, previously editing Motorcycle Sport and Leisure, currently in charge of Motor Cycle Monthly and also the man behind the industry-leading website More Bikes. He’s also ‘that bloke off the telly’ who was a frontline presenter on Eurosport. 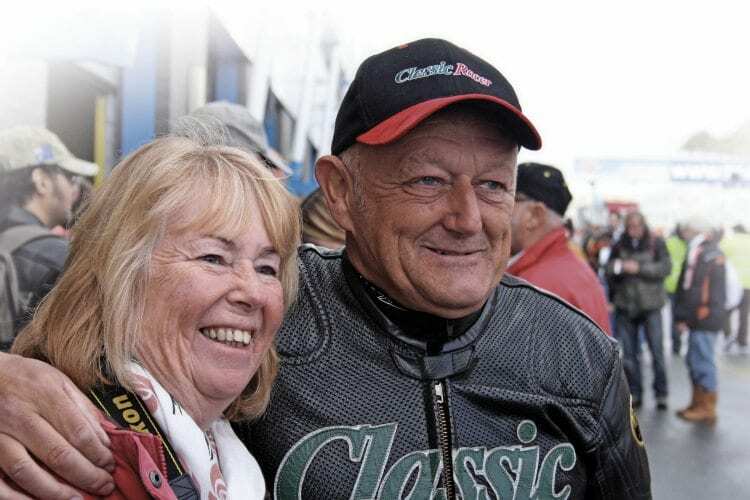 Tony edits Island Racer, our annual TT publication, he is passionate about all things motorcycle racing and loves nothing better than nostalgia. Sounds like the man for the job to me. Please make Tony welcome, keep him on his toes just as you have me, and pass on your knowledge, as I know he will welcome it as he grows into ‘your’ magazine. I look forward to catching up with at least some of you at a show or race meeting in the future.